Star PowerRicochet’s bullets, from attack and Super alike, get supercharged by their first bounce and deal +80 damage. Ricochet’s bullets bounce off walls, gaining range. They can hit enemies behind cover. Ricochet fires a long burst of bullets that pierce through enemies and bounce off walls, gaining range. Great in open space maps that have lots of brushes. Pretty hard to use for avg players. Great in Bounty. Always need to be played hide and seek. Ricochet is the squishiest character in the game, sitting at 500 health, 100 HP behind Colt and Brock. 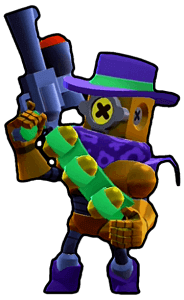 Ricochet is a rare Brawler, so not everyone will have him. Though he seems like a crappier Colt, I am going to show you that he isn’t! Ricochet’s 2 best attributes are his long range and his bouncing bullets. His bouncing bullets are extremely underrated, as a player with good aim can hide behind walls and take out enemies on the other side, while not being touched! In team modes, Ricochet acts as sniper and cover fire because if he rushes into battle, he will most certainly die! He is better suited to picking off enemies while hiding in grass or behind an El Primo. Don’t use Ricochet in Showdown unless you are VERY, VERY (Cannot stress it enough) VERY confident (or foolhardy XD) because of his minimal health. The reason Ricochet is overshadowed by Colt and Brock is his health. His meager 500 health makes him very easy to take out. Ricochet will lose just about every 1 on 1 confrontation, except if you are being chased by an El Primo who is not close enough to strike you. Always hide behind a wall or a tank, and you should rarely collect crystals in Smash and Grab because if you die, which happens often, trust me, your team will lose several crystals a Shelly could have been more responsible with. This is where Ricochet shines. His ricocheting rounds deal a base 80 damage per bullet, and he fires off five of them. If you aim properly and hit a brawler with all five shots, you will deal an amazing 400 damage! You only need to hit a Shelly 10 times to kill her, and Ricochet’s bullets are difficult to avoid because they travel very fast and bounce off of walls. A great way to defeat an enemy 1 on 1, where Rick struggles, is to kite them into a narrow passage and shoot at the walls, causing a line of bullets that your aggressor must travel through to reach you. This is basically Rick’s main attack, however it shoots several more bullets and has a longer range! It is comparable to Colt’s special, but Colt’s special instead annihilates walls instead of caressing them and leaping off XD. The best ways to utilize Rick’s special would be to attack fleeing enemies (due to the long range) or use it to lock down a zone, such as the mine to allow a teammate safe passage to pick up some gems, or to attack all 3 opposing Brawlers when they are clumped together. Shelly is a difficult Brawler to fight due to her high damage, exceptional health, and long range. The key to success is: KITE, KITE, KITE! As a rule of thumb for every Brawler, never get in close, especially with Shelly because one well timed shotgun blast is enough to one shot Rick. Colt is almost the same as Ricochet, but his bullets don’t bounce. Try to get into a situation where he has to walk through your bullets to get to you, but other than that, you just have to have better aim. However, if you can get behind a tank, you can easily take him out. Same as Colt, but easier to avoid his rockets. Brock also has an extremely low recharge rate, so it is very easy to shoot him more than he can shoot you. Once Brock wastes his rockets, you can get closer (still risky) to have a higher chance of bullets hitting him. You can tank two direct hits from Brock, but most Brocks are incapable of doing so. The main problem against Jessie is her bullet’s ability to bounce off of brawlers and hit you even when you are behind cover. Make sure to always be vigilant and never forget her bullets don’t disappear after hitting someone. The turret is extremely easy to deal with because you outrange it and you can take it out with 2 orange ammo bars (10 hits in total). Jessie is also a lower health brawler and now she only deals 140? I think damage after her nerf. Easy to deal with because you outrange her. Dynamike is fairly easy to counter as long as you can avoid his bombs. However, you will have to go into the open to attack him because he can throw over walls and you can’t. AVOID HIS SPECIAL AT ALL COSTS!!! One hit from his mega bomb will send you to the “New Life In … Seconds” screen. Other than that his low health and his inability to chase you makes him easy to kill and escape from. If he is too far away to land hits, you will easily be able to kill him. However, his Super can land him right next to you and take out almost half of your health. Best to let someone else tank his hits while you shoot safely from afar. A tankier Shelly with higher damage and shorter range. Very easy to defeat if you (surprise, surprise) don’t get in close. Like El Primo, his special could land him right next to you so always look out for that. Time to play the aim game! Basically whoever lands more shots will win. Don’t try to trap him in a tight corridor because his bullets bounce too (duh) Probably best to let your Shelly take him out. Barley has a poison instead of immediate damage so try not to get caught. Barley’s special is hard to deal with as well because of your low health. You outrange him so you can pick him off. Try to deal with Poco before others because of his heal ability. Mortis can charge right up to you and take you out very easily. However, try to attack him so that when he charges to hit you, he’s actually charging straight into a mouthful of bullets! If you can, hide in the grass and pray he didn’t see you. Bo’s range is as long if not longer than yours so try to avoid him. Always stay a safe distance away to avoid his bombs too. Typically a Bo will beat you because he doesn’t have to be as accurate with his arrows because they explode. You outrange his attack, but not the spikes that shoot out from it. Try to shoot from behind cover, but avoid direct confrontation and watch out for his special which does travel over walls. Never attack without a tank to shield you! His special is similar to El Primo’s in range, but Crow is unlikely to attack you from right in front of your face because his arrows don’t do a lot of immediate damage. If you are low on health, he might use his special to finish you off. Ricochet has amazing potential to be a great brawler, but lacks health to get there. Instead, he falls in the shadow of Colt. However, you can take out many brawlers with experience. Never get in close, it’s basically a death wish. Hide behind walls/tanks so they absorb damage instead of you. In the right hands, Ricochet can be the best brawler in the game. This has been The Complete Guide to Ricochet by electr0ns, thanks again for reading! i cant wait to use him! second after repost! happy that this got posted!! Thanks for the insane guide buddy! thanks for editing it too! it was dont use in showdown unless you are confident. i have won showdown 7 times with him but have also lost a ton too. he is very high risk reward in showdown.